Where Are Some of the Best Spots for Midtown Atlanta Nightlife? When the sun goes down in Midtown Atlanta, the fun begins! Whether you’re looking to relax on a rooftop with your favorite cocktail or dance the night away to your favorite song, we can point you in the right direction. 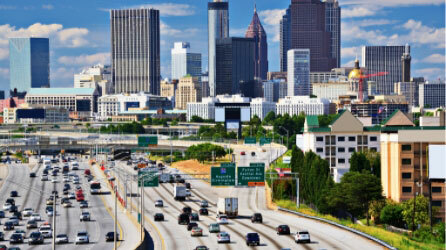 The best hotspots for Midtown Atlanta nightlife are within walking distance of Stonehurst Place! Our favorites are below, but this is far from the complete list. Explore our free Travel Guide to discover even more bars, clubs, and venues you won’t want to miss. Campagnolo is a short walk away from Stonehurst Place and features live music on Fridays and Saturdays from 10 p.m. to 1 a.m. at the bar. Arrive before the kitchen closes at 11 p.m. so you can try their exceptional food, too! One of our top bars in Midtown Atlanta is The Lawrence. (It’s one of our favorite restaurants in Midtown Atlanta, too!) Step inside at night and find a fun, upscale atmosphere waiting for you. Don’t leave before trying one of their cocktails! Choose one from the drink menu or tell the bartender your favorite flavors. They’ll whip something up special for you! Tiki Tango opened its doors in February of 2019, replacing the Lava Lounge with another exciting source of nightlife. This three-story bar takes you to a tropical destination with tiki-themed decor and drinks. It’s summer all year long here! We bet you can’t spend an evening at 9 Mile Station without saying “Wow!” This rooftop beer garden sits at the top of Ponce City Market, offering unparalleled views of Atlanta’s skyline. It’s simply breathtaking! There’s nothing like having a luxurious room waiting for you after a full night of excitement. That’s precisely what Stonehurst Place offers! Our historic inn features elegant accommodations in a convenient location in the heart of Midtown Atlanta. Walk to your room or suite at the end of the night and wrap yourself in seven layers of luxurious linens for a good night’s rest. In the morning, please your palate with a delicious breakfast and get ready for another fun-filled day! Consider the Hinman Suite for your next visit and relax like royalty. This gorgeous space features a king-size bed with a custom silk canopy and a deluxe bathroom with heated marble flooring. It’s the perfect place to unwind after a long night! Book your stay today and see why we’re No. 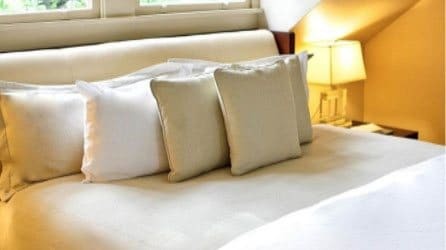 1 on the South’s Best Inns of 2019!